On Saturday morning Amanda and I left for a week-long vacation to Las Vegas with a few other stops along the way. 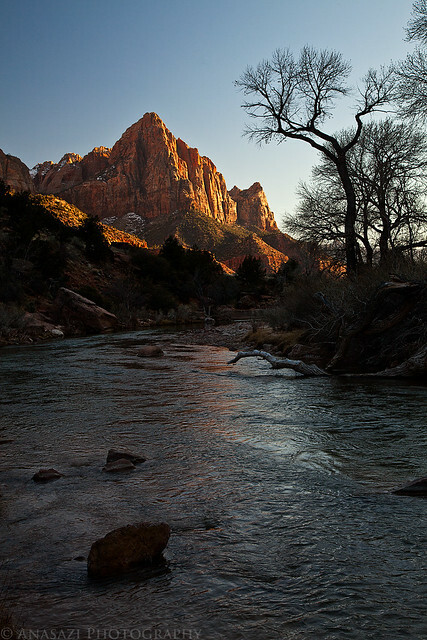 We would be spending our first weekend of the trip visiting Zion National Park for the first time. 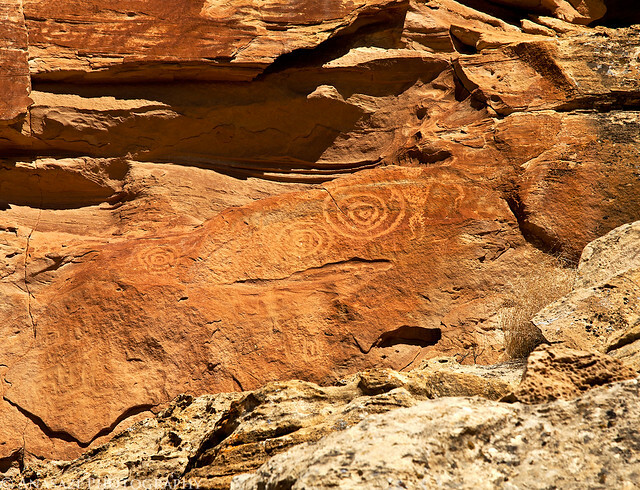 On our drive to Zion we made a couple of stops to visit some rock art. 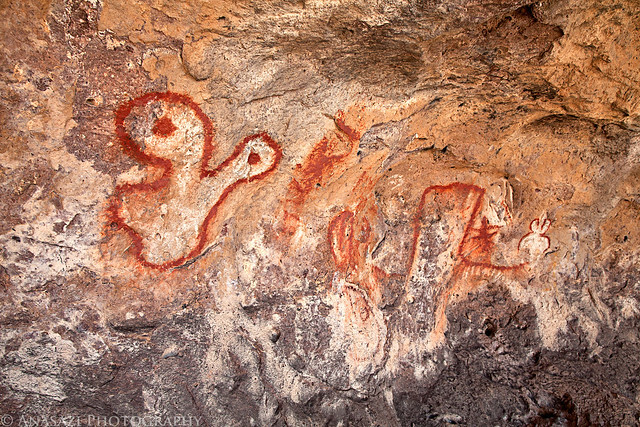 Our first stop along the way was just off of the Interstate near Richfield where I hiked up to some petroglyphs. 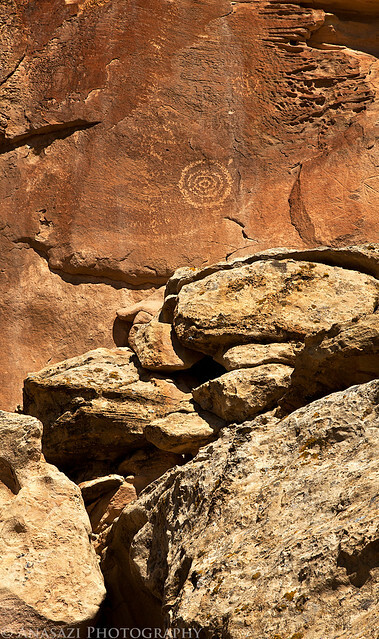 There were many spirals found here including these larger ones. 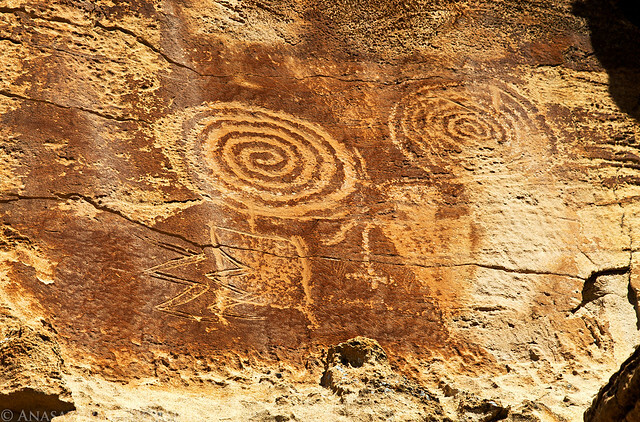 A few smaller spirals and an anthropomorph. 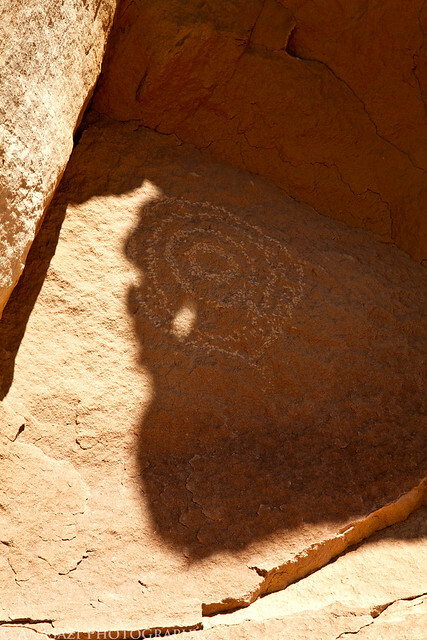 There was a small hole in the sandstone overhang that cast a shadow on this petroglyph. It makes me wonder if the dagger of light might line up with the center of the spiral on a particular day and time…perhaps on the equinox or solstice? 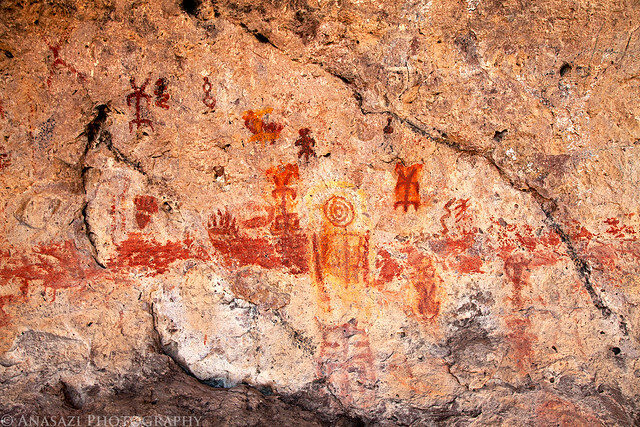 After having some lunch in Richfield we continued on and took another short side trip out of Cedar City to the Lions Mouth Cave pictographs. Here’s a stitched panoramic of the main panel found here. 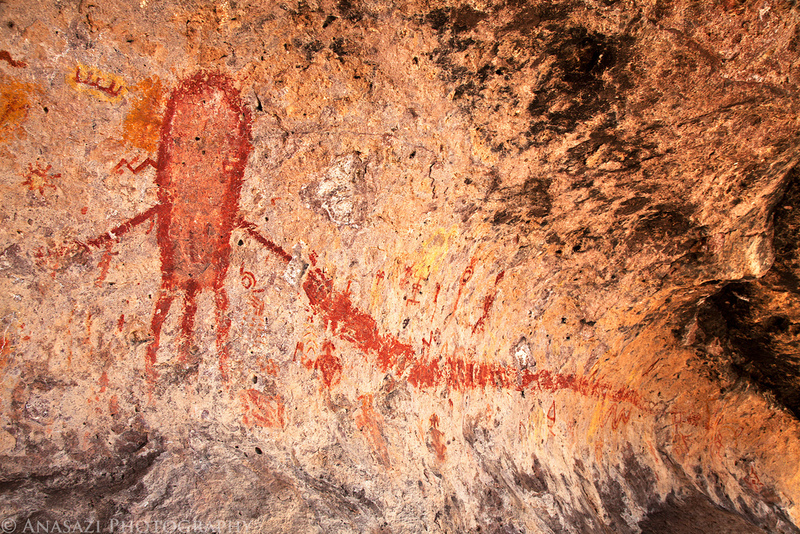 Here’s a few photos showing a few other views of the pictographs found here. After finishing the drive to Zion and checking into our hotel just outside of the park we took an afternoon drive through Zion Canyon to get a nice overview of the park. 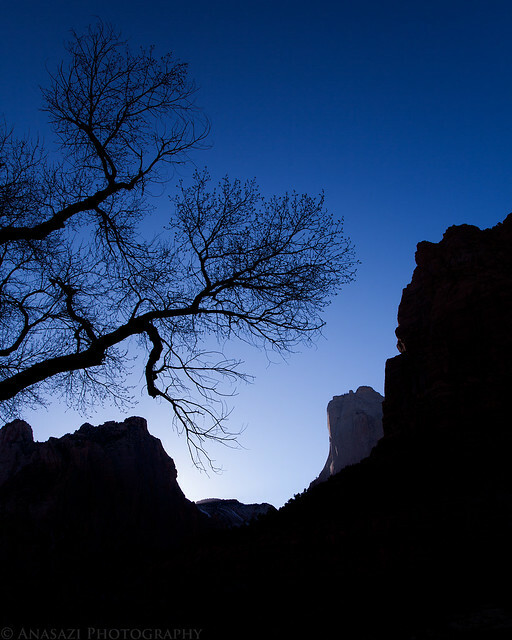 After taking the short hike up to Weeping Rock we stopped by the Court of the Patriarchs and I liked the light that was currently striking them with the dark branches that seemed to compliment the cliffs in the background. Even though there were no clouds in the sky and no fall colors I decided to take a photo of the last light of the day on The Watchman over the Virgin River anyways. After the sun was down we headed back into town and grabbed some garlic burgers from Oscar’s for dinner which were really good. Then it was back to our hotel so I could get some sleep before sunrise came again on Sunday…especially since we would be losing an hour thanks to Daylight Savings Time.